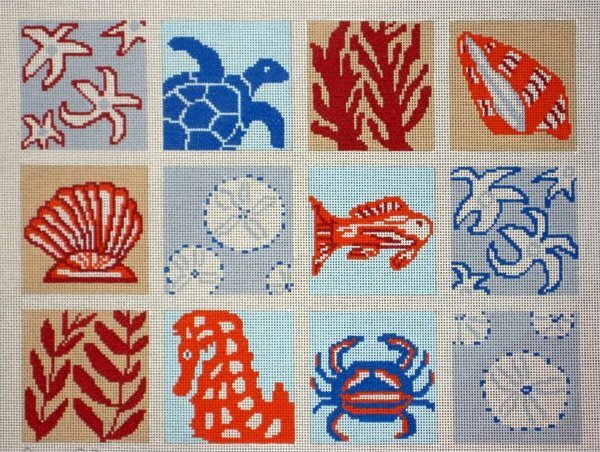 A fresh and beachy needlepoint design. This design is handpainted onto 13 mesh mono Zweigart needlepoint canvas. Available as canvas only or with cotton, wool or silk threads. We kit with DMC embroidery floss (cotton) or Planet Earth boutique wool and silk fibers. This Ocean Collage handpainted needlepoint ships free anywhere in the world. Contact us with any questions about this Ocean Collage handpainted needlepoint canvas. We are always very glad to help.